Wages have been stagnant through two official “recoveries” in this century, under both Democratic and Republican presidents. This week, beneath the stock-market gyrations, the mechanics that shackle the average worker’s wages were exposed once more—not in Donald Trump’s White House or Paul Ryan’s Congress but in the supposedly apolitical operations of the Federal Reserve. In today’s economy, with weak unions and large, multinational corporations, wages begin to stir only when the economy nears full employment. When labor is in demand, workers can push for better wages and benefits. Companies find themselves under pressure to raise pay in order to avoid losing good workers to competitors. Yet the mere hint of rising wages creates warning flags at the Federal Reserve, America’s central bank. Corporations could pass on rising wages to consumers by raising prices, and rising prices could feed inflation. The Federal Reserve has the dual mandate of fostering the highest levels of employment and stable prices. The Fed governors have decided—arbitrarily—that steady 2 percent inflation is the target that they hope to sustain. They maintain, despite little evidence, that once inflation starts it can spiral out of control, so they assume that they must act preemptively to slow the economy by raising interest rates. In turn, the economy slows, workers lose jobs, their ability to demand wage hikes is reduced, and inflation is slowed. Last week, the country got what appeared to be good economic news—a decent jobs report, top-line unemployment remaining at 4.1 percent, and average hourly wages inching up 2.9 percent over the 12 months ending in January, which was the highest increase in the nine years of the recovery. Yet the stock market tanked. The fear that rising wages could lead the Fed to hike interest rates faster, and slow the economy, helped trigger the stock selloff. That panic is testament to how much the game is rigged against workers. Inflation—at 1.5 percent in 2017—remains below the Fed’s target. Prices aren’t rising too fast; they are rising too slowly. The economy has grown slowly in each of the past three years. Rising wages are more of a dream than a reality. In real terms, wages went a nearly invisible 0.6 percent in 2017. In previous expansions, they’ve gone up over 4 percent without America turning into Weimar. Unit labor costs are up all of 0.2 percent in 2017—the lowest gains ever at this point in an expansion. The 2.9 percent wage hike reported by the Bureau of Labor Statistics in January measures the increase over the year of annual hourly earnings of all workers. But as Doug Henwood writes in Jacobin, workers didn’t pocket most of the increases; managers did. The BLS also reports on the earnings of workers who are not supervisors. Those rose only 2.4 percent in January over the previous year—that is about the same that they rose in January 2016 over the previous year. Workers’ wages are barely keeping ahead of the cost of living. Supervisors are doing better—and will do even better when the regressive tax cuts kick in. Meanwhile, workers’ bargaining power has been decimated. Unions represent about 6.5 percent of the private workforce. Union contracts no longer have built-in cost-of-living hikes. Workers capture a dramatically smaller percentage of corporate earnings than they did in the 50 years between 1950 and 2000. One analyst estimates that if the worker share of earnings had stayed the same in this century, employees would have pocketed a staggering $10 trillion more in wages over the last 17 years. That’s the reality. Despite Trump’s boasts, the economy isn’t taking off. The growth of real wages is near zero. The wage share of the economy is near record lows. Profit margins are near record highs. And as Paul Krugman notes, demand has been sustained not by rising business investment but by consumers drawing down their savings. Consumer debt reached record heights in 2017. Obviously, for workers to recover, wages have to be allowed to grow. With the Fed poised to pump the economic brakes whenever wages begin to stir, stagnant wages will remain a feature—not a bug—of the current economic consensus. These shackles on workers’ wages have little to do with who is in the White House. Obama’s Fed Chair, Janet Yellen, at times wisely ignored right-wing Cassandras who were rending their garments about imaginary inflation while the economy was barely breathing after the worst financial collapse since the Great Depression. But under Yellen the Fed did begin to preemptively raise interest rates, even though the economy hadn’t come close to the Fed’s supposed target of 2 percent inflation. 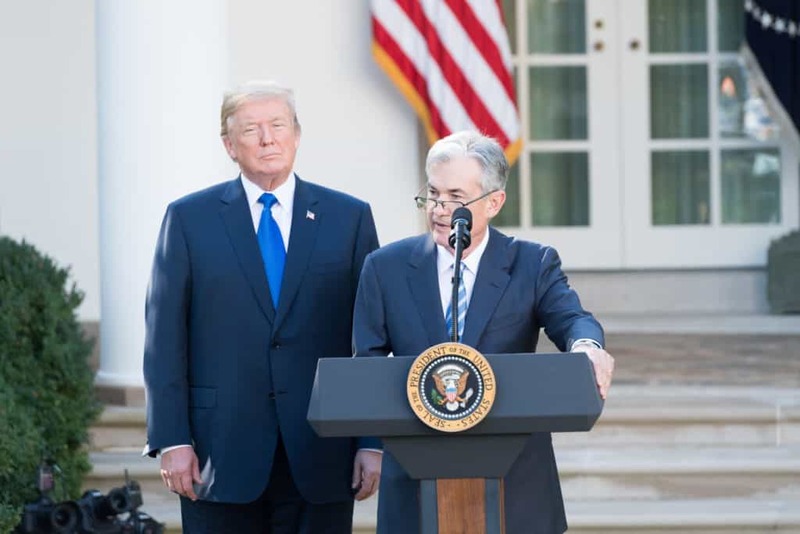 Donald Trump foolishly replaced Yellin, and his nominee, Jerome Powell, is likely to be much more receptive to the arguments of inflation scaremongers. In either case, the wage increases that workers desperately need are virtually ruled out by the doctrine that the Federal Reserve’s governors follow. What can be done to get workers out of the box they are in? Progressive movements and politicians in power can lift guaranteed minimum wages, expand guaranteed benefits, and strengthen workers’ ability to organize and bargain collectively. Basic needs—health care, education, childcare, retirement security—can be publicly guaranteed, supported by progressive taxes. Federal and state legislators could levy higher taxes on corporations that sustain a yawning divide between executive pay and the wages of average workers. The perverse remuneration system that gives CEOs multimillion-dollar incentives to cook their own books could be outlawed. Companies that pay their workers well and respect their rights could be given preference in contracting at every level of government. The cribbed doctrines of the Federal Reserve must also be challenged. The inflation target should be higher and preemptive wars against inflation should be discarded. Congress could revise the Federal Reserve’s mandate to emphasize running the economy at full employment with rising wages and moderate inflation. Progressives should follow the lead of Fed Up, the project of the Center for Popular Democracy, and challenge appointments to Federal Reserve and its member banks, demanding greater representation of workers, consumers and poverty advocates. The Fed’s decisions aren’t technical but rather intensely political, as a statement of values. If the Fed’s much-touted independence can be used to support wealthy bondholders and not workers, why should voters put up with it? Let presidents appoint the governors like they appoint cabinet members, and let voters hold the president accountable for the results. For now, the recent tax cuts and the budget deal are likely to produce a $1 trillion annual deficit in coming year while stimulating an economy that is already growing with relatively low unemployment. The question is whether the Federal Reserve will hold its fire, ignore the bankers on Wall Street, and allow wages to rise, even if inflation begins to creep up. Is the system really so rigged that workers can’t get wage hikes even in a full-employment economy? We are about to find out.